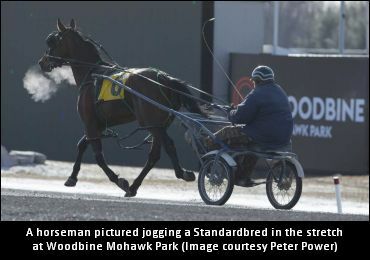 Officials with three Ontario Standardbred raceways have announced that they have closed their tracks for training on Tuesday (Feb. 5). Officials with Woodbine Mohawk Park would like to inform all horsepeople that the track and paddock will not be open for training on Tuesday morning (Feb 5). The closure is to allow for the track crew to perform maintenance on the racing surface. The track and paddock are scheduled to reopen for training on Wednesday (Feb. 6) at 7 a.m.
Officials with The Raceway at Western Fair District have announced that the London track will be closed for training on Tuesday morning (Feb. 5). Live racing at Western Fair is scheduled again for Tuesday night at 6:15 p.m. Officials with Western Fair have announced that they will monitor the track overnight and into Tuesday and will update the status of the program at that time. Trot Insider has also been informed that the main track at Rideau Carleton Raceway will be closed for training all day on Tuesday (Feb. 5). To receive text messages from the Woodbine Mohawk Park race office text (416) 434-5893 and request to be put on the list or you can call the race office at (905) 854-7805. To sign up for Alliance racetrack texts please contact the Clinton race office at (519) 482-5270 and request to be added to their list.